For detailed information about GSEQ, the best source is the extensive Help file contained in the program. Just select help form the main menu. Behavioral scientists – including those in psychology, infant and child development, education, animal behavior, marketing, and usability studies – use many methods to measure behavior. Systematic observation is used to study relatively natural, spontaneous behavior as it unfolds sequentially in time. 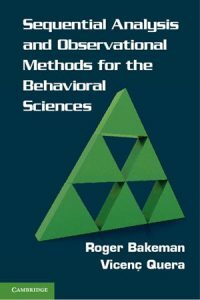 This book emphasizes digital means to record and code such behavior; although observational methods do not require them, they work better with them. Key topics include devising coding schemes, training observers, and assessing reliability, as well as recording, representing, and analyzing observational data. In clear and straightforward language, this book provides a thorough grounding in observational methods along with considerable practical advice. 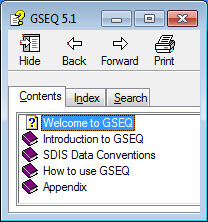 It describes standard conventions for sequential data and details how to perform sequential analysis with a computer program developed by the authors. The book is rich with examples of coding schemes and different approaches to sequential analysis, including both statistical and graphical means. Bakeman, R., Quera, V., & Gnisci A. (2009). Observer Agreement for Timed-Event Sequential Data: A Comparison of Time-Based and Event-Based Algorithms. Behavior Research Methods, 41, 137–147. Bakeman, R., & Quera, V. (2008). ActSds and OdfSds: Programs for converting INTERACT and The Observer data files into SDIS timed-event sequential data files. Behavior Research Methods, 40, 869–872. Quera, V., Bakeman, R., & Gnisci, A. (2007). Observer agreement for event sequences: Methods and software for sequence alignment and reliability estimates. Behavior Research Methods, 39, 39–49. Bakeman, R., Deckner, D. F., & Quera, V. (2005). Analysis of behavioral streams. In D. M. Teti (Ed. ), Handbook of research methods in developmental science (pp. 394–420). Oxford, UK: Blackwell Publishers. Bakeman, R., & Gottman, J. M. (1997). Observing interaction: an introduction to sequential analysis (2nd ed.). Cambridge, UK: Cambridge Univeristy Press. Bakeman, R., & Quera, V. (1995). Log-linear approaches to lag-sequential analysis when consecutive codes may and cannot repeat. Psychological Bulletin, 118, 272–284. Bakeman, R., & Quera, V. (1995). Analyzing Interaction: Sequential Analysis with SDIS and GSEQ. Cambridge, UK: Cambridge University Press. ISBN: 0-521-44451-9 (hdcv), 0-521-44901-4 (ppbk). Bakeman, R. y Quera, V. (1996). Análisis de la interacción: Análisis secuencial con SDIS y GSEQ. Madrid: Ra-Ma. ISBN: 84-7897-206-4. These books have been out of print since 2005.